Happy Friday y’all. I hope you have a glorious weekend ahead of you filled with adventures and time to catch some ZZZZZZs. Graham and I are driving to Omaha, Nebraska today. That’s right, Omaha. We’re off for Berkshire Hathaway’s (Warren Buffett’s company) annual meeting. As shareholders, it is something we have wanted to do because it is a scene and we will never be so close to Warren’s hometown again. We’re off to the “Woodstock of capitalism;” Omaha will be busting at the seams with people who have made the pilgrimage to hear the oracle himself speak. I am fascinated by Buffett – I even read all 900 pages of “Snowball,” an in depth biography about him. 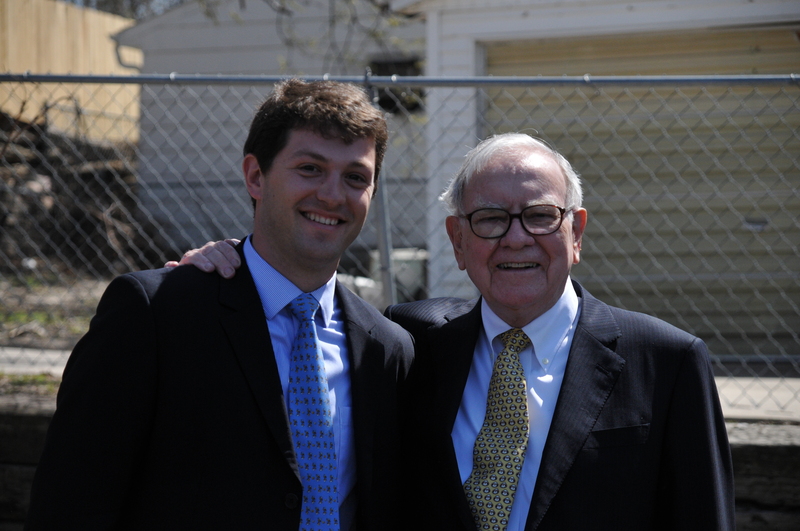 Graham got to sit across the table from Buffett at a luncheon not so long ago – LUCKY!! I am excited for the trip. However, I can’t go another weekend without sneaking in some design. I’m thrilled because one of the companies that Warren invested in is Furniture Mart. They will be selling stuff at the annual meeting at a steep discount. I have a friend who picked up a fabulous rug there last year. So, yes, we are going to hear Warren speak…but, I may have some ulterior or should I some Interior motives as well. I love the show Modern Family. If you haven’t seen it, you are seriously missing out. I wouldn’t blog about it if I didn’t mean it. That half hour makes me laugh till my tummy hurts. You agree? Not only is it hilarious, the homes are such fun to look at. I figured we could play house today. If you could pick a house from Modern Family to live in, which one would you pick? 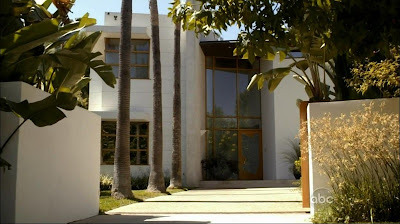 Would it be Cam and Mitchell’s Spanish style casa, Phil and Claire’s traditional digs, or Jay and Gloria’s modern abode? 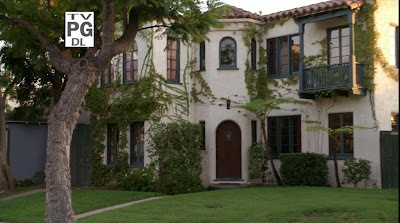 If you’ve seen the show or based on these exterior home shots, which one would you choose? 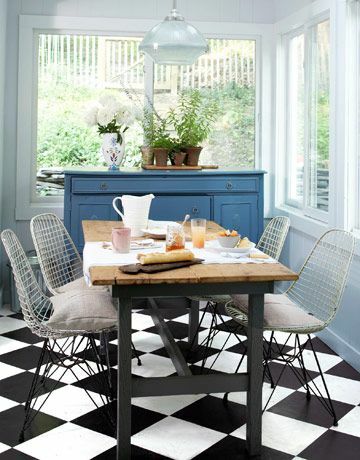 I have a friend who is putting in black and white checkered laminate flooring to her kitchen. First of all, fantastic choice! 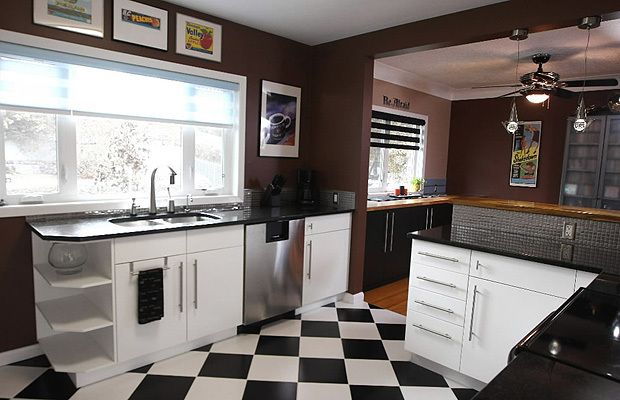 Graham and I have black and white flooring in our current kitchen and we love it. The only issue with our floor is that the laminate is very old and it is coming up in parts. 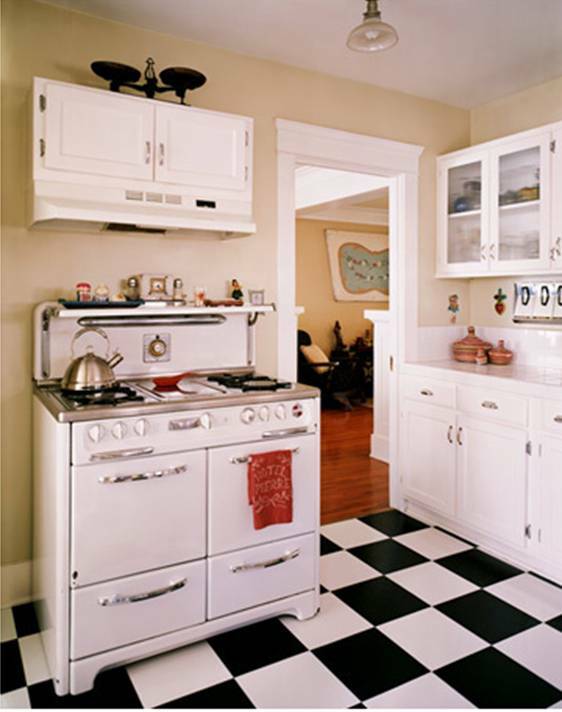 I guess that’s part of the “charm” of renting a brownstone with “character.” When we own a place one day, Graham and I both want the black and white checkerboard flooring – it is so classic. My friend is picking out a paint color for the kitchen to go with her new floors. I believe she has chosen a soft yellow, which is a great choice. You can never go wrong with a soft yellow in the kitchen. Plus, the beauty of black and white is that it goes with all colors. 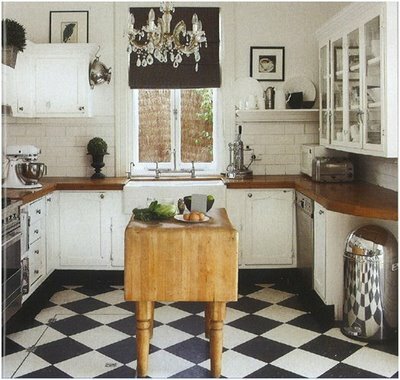 For my future dream kitchen, I think I would maybe do crisp white walls and then put in kelly green or colonial red for accent colors. 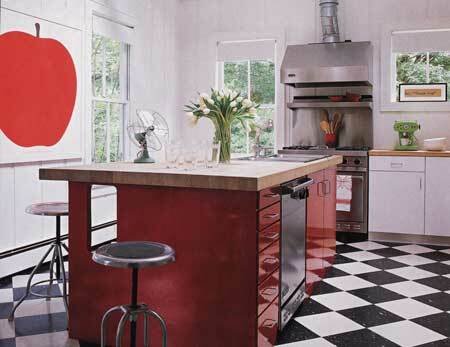 Check out the red apple painting! Hope this helps to inspire paint choices. I have about one million crushes on different designers. I have been looking for a perfect rug that fits the space for a client and I decided to peruse one of my favorite rug designer’s site: Madeline Weinrib. 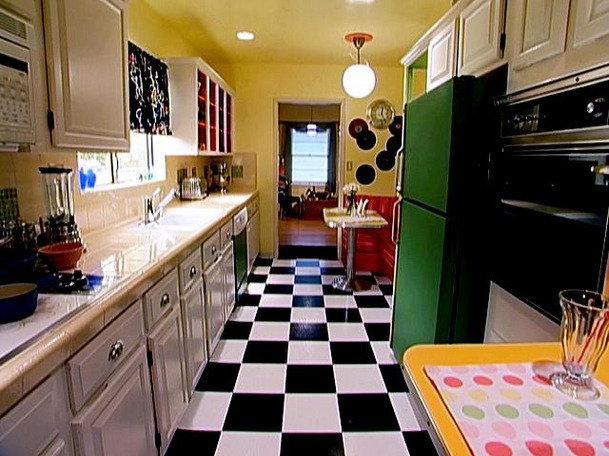 She is the granddaughter of the founder of the legendary ABC Carpet & Home in New York City. Weinrib is a painter as well as a designer and so she brings vivid, bright colors that you see in her paintings to her rugs. I love the colors, textures and designs. She is out of my budget for now but someday I hope to be an owner of a Weinrib rug. I checked on ebay and there is one new 10 X 14 rug for sale for $3,000, click here if you are interested. She also has furniture, textiles and pillows for sale that make my heart swell, but for now I’ll concentrate on her rugs. What do you think? Are you crushing as well? What rug would you buy? Love, love, love. I swoon over such amazing beauty but I shall not open my wallet, I shall not open my wallet, I shall not open my wallet, I shall not open my wallet…. Coming off of a weekend in Vegas, where we went to the same club as Paris and Nicky Hilton, I thought I’d show some pillows that are cute but more for a celebrity budget. Because we’ve all got some slim shady in us, it’s time that our couches get cool with these awesome cushions. The cushions are actually $450 each so I’m automatically out. But if you can swing it, put down some dolla’ dolla’ bills yo and get yo shady on..
Pillows available at the Rug Company by Tara Bernerd. Click here for more information. Happy Earth Day! I hope you are having a wonderful day and are giving the earth a nice break today by trying to do something eco-conscious. I have always tried to do a little bit to help out the earth; this interest began at a young age when I was the Ecology Commissioner in the seventh grade. Funny, but true. 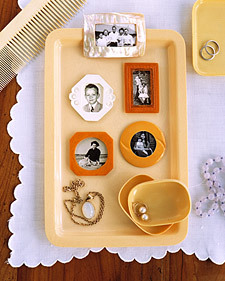 Nowadays, I try to do my part with little things, by shopping vintage and by finding ways to use objects that would otherwise be thrown away. 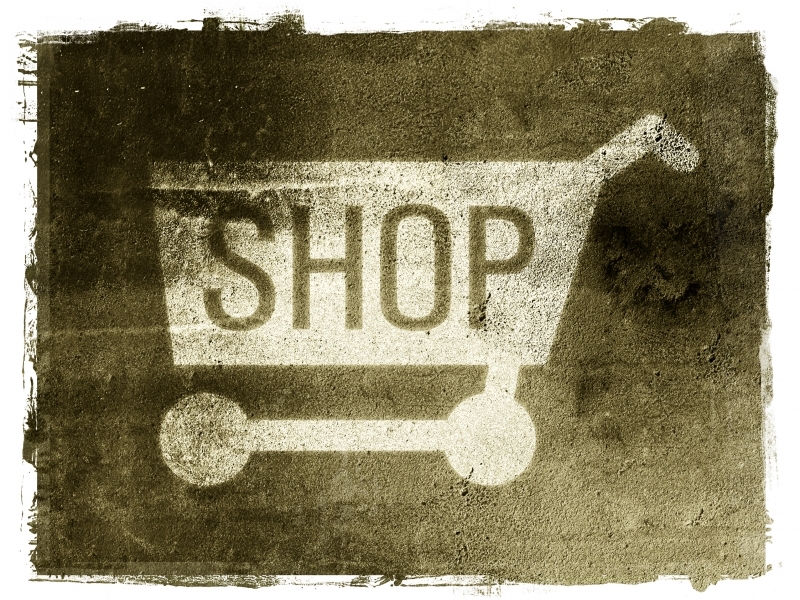 I actually have come to the point where I prefer shopping at flea markets, etc. because there is a challenge to it and such high rewards. 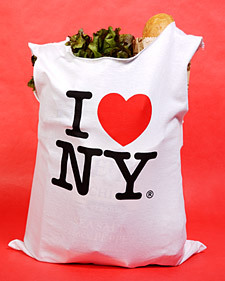 Transform an old shirt into a shopping bag. I don’t know about you but I have a bajillion t-shirts. People may give me strange looks at the grocery store, but at least the Earth will be happy. There are so many great belt buckles out there, tons sold super cheap at flea markets. Martha has taken belt buckles that seem useless without a belt and transformed them into a great beside memento or even better as a fridge magnet. Have some cereal (while reading my blog) and then once your done use the box to organize your bills and paperwork. Oh Martha. Only she can make Special K look so special. Happy earth day! What are some things you do to help the earth? 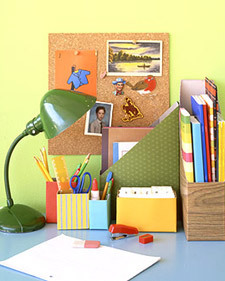 Do you know of any fun recyclable craft projects? I would love to hear about them!